I wanted something special for this, my 800th post to Plymothian Transit (I still cant quite believe that!) so I was thrilled to come across this photo by Alan Thompson. I can still remember the days when Milehouse was wall to wall Atlanteans which was always an impressive sight. Long rows of Darts are just not the same! To be fair to the Darts - it was really the large batch of those horrible Renault bread vans which saw of many of the double deckers. At least the move to Darts has seen the return of larger proper buses. 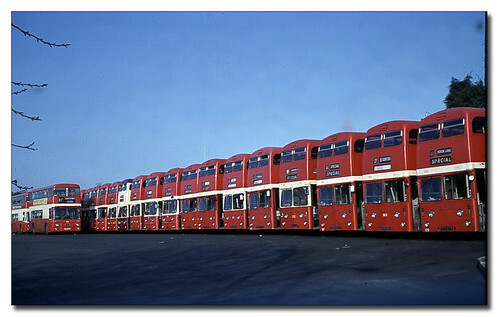 I dont suppose we will ever see any new double deckers for Citybus again though. Its good that at least First Devon and Cornwall are investing in double deckers for Plymouth with both new and secondhand additions to the city over the past year or so. Thanks to Alan for allowing me to post his photo here tonight. Thanks to all who have commented and allowed me to use their photos etc over the past 800 posts.